Xls Viewer, Free Xls Viewer, Microsoft Xls Viewer, FoxPDF Xls Viewer. Free Xls Viewer - Open, view, and print any Excel(Xls,Xlsx) workbooks file. The best Free Xls Viewer Available. Xls Viewer let you free Free Open, view and print any Office Excel(Xls,Xlsx) file. It is a free windows application for Open, view and print any Microsoft Office Excel ( Xls ,Xlsx) document. 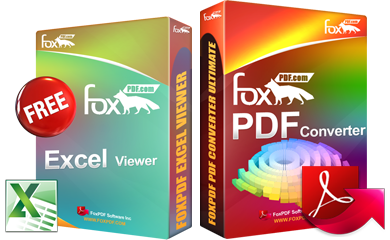 Xls Viewer from FoxPDF lets you open, view Excel Xls, Xlsx and Rtf files as well as TXT files and it doesn't require Microsoft Excel. It can run as a desktop application in Windows. It offers a variety of viewing options. Xls Viewer can print normally in your usual app. Xls Viewer's displays images clearly and crisply, especially. Xls Viewer's View menu let us Pan and Zoom, Fit All or Width, Rotate and Mirror. If you need to view Word files without Microsoft Excel, Xls Viewer is your best option. 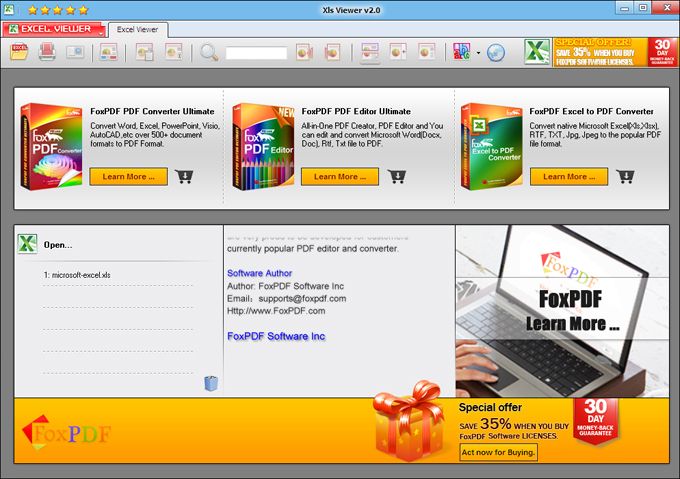 If your needs exceed its capabilities, FoxPDF is available. It's not free, but it's a lot cheaper than Excel.
. Open, View and Print Word files form Xls Viewer.
. Standalone software, Microsoft Software and Microsoft Excel NOT required!
. Xls Viewer Support can Open, View and Print in high speed. Step 2: Run Xls Viewer, then Open Excel files to View and Print panel. That’s all, it's very easy for you to Open, View and Print Excel files with Xls Viewer. Why you need to Open, View and Print Excel(Xls, Xlsx) File? Microsoft Excel is a commercial spreadsheet application written and distributed by Microsoft for Microsoft Windows. However no MicroSoft Excel software on the desktop, you want to open, display and print a Excel document, you can use Xls Viewer. Xls Viewer is a free windows application for quickly Open, view and print any Microsoft Office Excel ( Xls ,Xlsx) document.